Fine in Fine jacket. Size: 4to-over 9; Beautiful dark blue hardcover has negligible wear. Unclipped dust jacket in new mylar shows well. 112 pages of tight & bright text with no tears, writing, soil or blemishes. 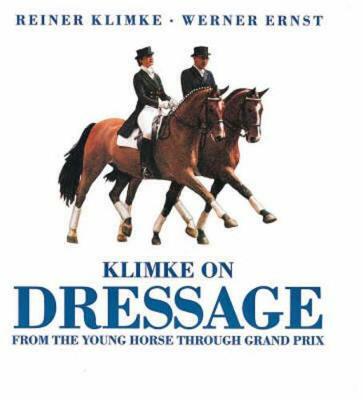 Follow the development of the dressage horse from the youngster to the maturity and majesty of the Grand Prix horse. Very Good- in Good + jacket. Mylared A nice reading copy. Pages are clean and bright. Binding is tight. Book and jacket show some shelfwear. Jacket has been mylared for protection. Color and black and whtie photos throughout. This is an oversized book and may require extra postage. Very good in very good dust jacket. one inch tear on bottom spine of dust jacket. Sewn binding. Paper over boards. 112 p. Audience: General/trade. Very good in cloth boards, lacking the dust jacket; bottom outer corner of pages lightly rippled from moisture exposure but text is clean, bright and undamaged.